I love Indian food but I do not love Indian food on the Upper West Side. Goopy, poorly seasoned, short of protein, brimming with grease: well you get the picture. But there is hope! The lovely wife and I were going to meet friends for dinner last Saturday night and were looking for a place to eat. A brief trip to Zagat.com (worth the annual fee, in my opinion) revealed to us that Indus Valley, at 100th Street and Broadway, received a 23 for food! If there was ever proof for the power of Zagat, it was our rapid decision to head to Indus Valley for dinner. All four of us were impressed with the appearance of Indus Valley. To paraphrase our friend, it was like an Upper East Side Restaurant. The lighting was soft, there was room between the tables, it was tastefully decorated and it wasn't to noisy, despite the fact that every table was filled. The service was good, although the waiter tried to push the Chilean sea bass special on us one time too many. 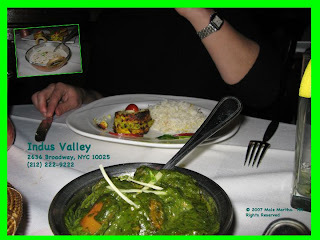 And although I think that the 23 for food is more out of shock that any Indian food up here is even edible, the food is good and certainly the best that I have had outside of Little India, Flushing, Jackson Heights and friends' homes. 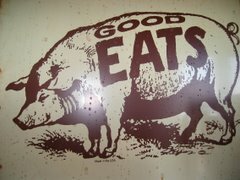 The food is quite tasty, although some dishes are better than others. We ordered both the alu chat and chicken chat as appetizers. Both were good, but they were similar tasting and I would pick one (the potato (alu) was better) next time. The lovely wife loves saag, and the lamb sagwala was excellent. Also to be repeated were the black lentils (dal). Chicken tikka masala is very good. Nan tasted fresh, but were not significantly better than other nan I have had in the neighborhood. Rice is plentiful and flavorful. We even tried the paneer special. Their paneer comes as large pieces of the paneer cheese with flavorings added. It was different from what I was used to, but it was good. I would recommend sharing it so that everyone can have a small taste. The next time you need Indian in 10024 or 10025, I would strongly recommend Indus Valley. Agree whole heartedly with Indus Valley, as it was around the corner from my former home, we were weekly patrons. Big fan of their reshmi kabob, a chicken saausge than is grilled the tandoor. Their Tandoori mixed grill also offered a good sampler of items. The real question is how does it compare to all those places in London?